Able to be used in intermittent duty applications, 100 VA SURVIVOR model features short circuit and overload protection to withstand direct short circuit in excess of 15 days. It does not require external protection or internal fusing and can be sized for average or continuous current load. Available with 60 Hz or 50/60 Hz ratings, product has UL-Recognized Class 130 (B) insulation. 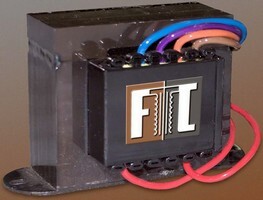 Primary input voltages include 115, 115/230, and 200/230 V with 24 V output.